My cast iron pans were super neglected and abused by moi. I haven't been really cleaning them properly since I've bought them and have been using them for almost a year now. Today, I decided that I should be a responsible owner and give them a good scrub to get rid of the year-old stains and burnt crusts. So I made a paste with salt+water and used my detergent free sponge to really give the pans a serious scrub. It wasn't so hard after all, I wondered why I hadn't done this much earlier....the coarse salt paste worked like a charm to rid even the toughest crusts. After several minutes of muscle power, the pans were starting to look as good as new again. I gave them a good rinse with tap water and dried them with some paper towels. 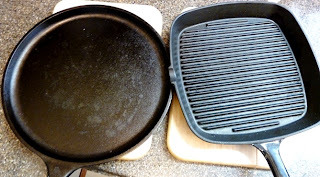 As I needed the pans to be completely dry....I put the pans on the hot stove for a couple of minutes. Then, I poured a little vegetable oil on a piece of paper towel and used it to wipe on the surfaces of the pans to lightly coat them with oil. There, now they are looking all spiffy and screaming to be used. It was a nice workout for my right arm and kinda therapeutic to see my favorite pans looking so great after the scrubbing. Call me silly....but such are my simple pleasures. Thanksgiving and my Black Friday haul! September and October flew past...just like that!